This tart is as beautiful as it is delicious. It would make for the perfect ending to your springtime meal ... I’m continuing to experiment with wheat-free baking, so I used whole grain spelt flour instead of unbleached all-purpose for this. I really liked how it turned out. The taste was a bit like a cross between a shortbread and a graham cracker crust. You could use whole wheat pastry flour or all-purpose flour, depending on what you like and what you’re able to find in your local store. In a mixing bowl, cream together the sugar, margarine and shortening. Whisk together the water and egg replacer in a small bowl until the powder is completely dissolved. Add this to creamed mixture and thoroughly combine, scraping the sides of the bowl. Add the flour and mix until a soft dough forms. Lightly grease a 9-inch tart pan and press dough into the bottom and up the sides of the pan. You may need to wet your hands if the dough is too sticky. 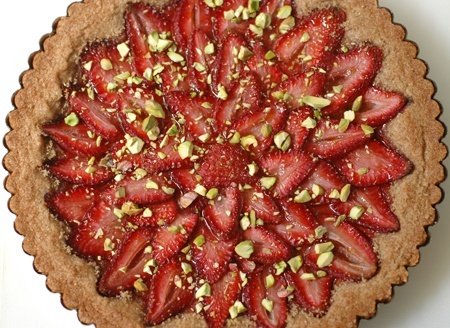 Arrange the sliced strawberries on top of the dough and bake for about 30 minutes, or until the edges start to turn golden. (If you use spelt flour, the baking time may be a bit longer). Turn the broiler on. Sprinkle about 2 tablespoons of brown sugar over the top of the tart and broil until the sugar is mostly melted. Make sure to watch it so the strawberries don’t burn. Cool, and sprinkle the chopped pistachios on top. Remove from pan to slice. This will keep in the refrigerator for a couple days.